Other essential supplies in your supply closet should include business envelopes, note pads and other paper supplies. You can also add card stock, mailers and office machine paper to this list. Because you need such a wide variety of paper supplies, you need to spend as little as possible, while still being able to choose from the widest selection you can find. That’s what Discounted Office Supply.com does for you. 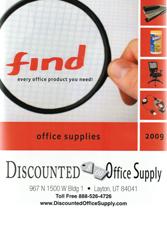 As an online retailer of janitorial and office supplies, we take great pride in our prices, selection and service. We can deliver anywhere in the continental United States from our 36 geographically located distribution centers. Browse by category below and order the supplies you need.